I've brewed the second batch of what I call an Americanized version of English Special Bitter. I'm a little worried about this batch because the aroma is a little unusual. There's a little bit of fennel or maybe a wisp of smoke. Phenols for sure, but very light. I used the Safale S-04 Whitbread yeast. The temperature of the room was an average of 75 degrees F. I'm hoping dry-hopping will overcome this potential defect in this ale. The Bitterness is not as pronounced as I had hoped, but this batch does seem to have more body than the last. I used American hops (Amarillo and Simcoe) and American malts (Briess), but I fermented with a Whitbread (English) yeast and add Burton Water Salts. Tonight I refilled the expired Pig and one quart-sized plastic bottle with the second batch of Special Bitter. This batch was the same as the last except for the homegrown hops and some of the specialty grains. For this batch I used 74 percent Briess DME, 11 percent Victory Malt and 16 percent 20L Crystal. Each of these batches were three gallons, since that is my motif these days. In the original batch I used 10L Crystal, so this new batch has a little more color. Also, I added an eighth-cup dry Simcoe hop pellets to the Pig with this batch which I'm hoping might cover up any potential flaws (see above) as well as add a flowery hop aroma. Meanwhile, I sampled a very small batch I brewed back in the third week of August. I had a three-pound jug of Briess LME left over from a Biere de Garde and instead adding this to the malt bill of a future recipe I decided to brew a two gallon batch wtih it. I added three ounces of Chocolate Malt I had on hand, some Spalter hops and some Fermentis S-33 yeast and brewed a dunkelweizenbock. This has actually turned out pretty good. I netted just six 22-ounce bottles from this batch and I wish I had more. Liquid caramel apple is kind of how I would describe this beer, which sounds weird, but it's actually pretty interesting. I will probably use the same recipe for next fall. Last night I savored a Samuel Smith's Imperial Stout; tonight I'm having another stout from Smith's: the Oatmeal Stout. This stout looks just as good if not more appealing then the Imperial. This very dark brown stout poured with a bit of a rocky head that rose up out of the glass and slowly settled to a persistent quarter-inch of khaki foam. Some ruby highlights come through towards the bottom of the glass; it's quite the pretty pint. The first whiff of this beer is laced with a very enticing smell of cocoa. The smooth sip that follows echoes the cocoa in the nose with some plum fruitiness then a vanilla-coffee flavor that fades to quickly to a dry chocolate finish. However, more than anything, this beer tastes cold. The beer geek in me reaches for the digital thermometer I use for brewing. The beer is barely 51 degrees Fahrenheit, which isn't really that cold. Perhaps a touch too cold for a stout, but I like my stouts closer 60 degrees than 50. I think I'm going to let this warm up a bit. Okay, I've waited about 10 minutes and the beer has warmed up to 55-56 degrees. That's the recommended serving temperature of this beer according to the importer of this ale, Merchant Du Vin. First of all, I feel I should note that a quarter-inch of khaki foam is still sitting there on top of beer. Impressive. I'm even more impressed that the drop of just a few degrees of temperature has taken the cold "sting" out of this beer and its flavors are more easily perceived. The drinkablility is enhanced, too. At 60 degrees, this beer is getting much sweeter than when I first poured it at close to 50. This is something I've noticed in some other dark beers, especially bocks and double bocks. It's bordering on too sweet for me; I think the brewer has struck a delicate between the malt and hops with this one. Overall, Samuel Smith's Oatmeal Stout is an enjoyable and sessionable stout that could be considered a bit sweet for some stout drinkers. Furthermore, it mustn't be served too cold to fully appreciate it's flavor. I can remember having my first Imperial Stout. I'm pretty sure it was my last year in college or perhaps right after college. (Okay, so my memory is a lot foggy.) 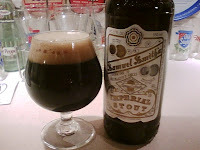 What do remember about my first Imperial Stout is that it was Samuel Smith's. I was fairly deep into the process of getting to know all the Samuel Smith's line of ales. They seemed like the ultimate Yorkshire (Tadcaster) ales at the time and to this day when I think Yorkshire and beer, I think Samuel Smith's and Tadcaster. One of the aspects of the Sam Smith's beers that really got me interested was how the brewery ferments in large, shallow slate squares. 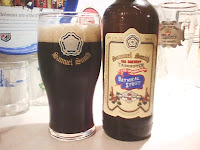 Anyhow, that first Samuel Smith's Imperial Stout was a 12-ounce clear bottle which showed just how black the stout was and I remember it having some very interesting burnt caramel and fig aromas and flavors. I remember it was a touch sweet and seemed pretty strong. Fast forward a dozen or so years. I see a Samuel Smith's Imperial Stout 18-ounce bottle on the shelf. I'm in the mood for stout and haven't Sam Smith's in awhile, so I go for it. This beer is now in a snifter on my desk and it smells great. The aroma is a bit rum-like with a raisiny component. The carbonation is ample, forming a light khaki head that falls to a thick quarter-inch of collar of foam. The liquid underneath the foam is opaque except for some deep dark brown at the stem of the glass. The first sip is as smooth as I remember, with dark fruit flavors of figs and currants, followed by a sweet and then burnt caramel flavor which coats the tongue with bitterness. This bittter finish, no doubt contributed by roasted grains and hops, is long with faint licorice fade that develops sip after sip. It's as good as I remember, if not better. Definitely a beer to sip and savor at near room temperature. Next up: Samuel Smith's Oatmeal Stout. I've noticed a lot of buzz about Budweiser American Ale. As far as I know, this is the first ale with the Budweiser name. (Anheuser-Busch has brewed ales under Michelob and other brand names.) Ever since hearing about this beer I've been very curious what a Budweiser ale would taste and smell like, so when I spotted a six-pack in Michigan over the weekend I decided to give it a chance. I think Bud American Ale can easily be classified as an amber or red ale. My bottle poured crystal clear read amber-red with a rocky white head. It's a good looking beer. The label mentions dry-hopping, but I'm disappointed: I detect no trace of hop aroma. A fruity, cereal smell is all I can discern, nothing like the familiar citrus-like scent of the advertised Cascade aroma hops. Once I'm able to work my way past the disappointing hop aroma, I'm struck by the smooth mouthfeel. If nothing else, this ale is smooth. A slightly tawny caramel malt flavor is evident with this beer, followed by a touch of hop spice and a quick talc-like dry finish. A very light hop bitterness lingers on the tongue after several sips. Overall, Budweiser American Ale is a bit lacking in body and hop character for me to buy this beer again, but it's inoffensive enough that I wouldn't turn it down if it was offered to me. That said, a much more pronounced hop aroma could make this beer much more interesting (at least to me.) Unfortunately for Bud, I think there are other established brands with better amber ales on the shelf around the same price range. Goose Island Kilgubbin is one example (albeit seasonal) and I think another would be Mendocino Red Tail Ale. These are beers I've had before, that I remember being a touch more interesting than Budweiser, but perhaps my favorite "American Ale" is produced by Rogue. No wonder I'm disappointed with Bud.